Some offices can be so boring they send you to sleep. A working day can feel like a month when there’s nothing to look at but blank walls and your computer screen. What if I told you there were offices out there with slides between floors instead of stairs and pirate ships instead of cubicles. It’s true! The most innovative companies and organisations are now creating offices that are awesome for any type of worker. They’re encouraging creativity and a better work life balance by making the work space more enjoyable and fun to be in. So how does your office measure up? Are you in open plan hell or multi-storey madness? Or are you skipping to your desk each day full of ideas and energy, knowing that you can take a nap when needed or a walk outside? Or does the layout make you feel sick? Are you begging for some distraction from the lacklustre atmosphere? So many questions! So many opportunities for your office to be cool! Let’s see how hip your office really is…. Is your office overflowing with entertainment? Is it a place of fun, friends and creativity or does it drain your drive and pummel your personality? Do you look forward to the walls of your workplace, or are you dreading every day? 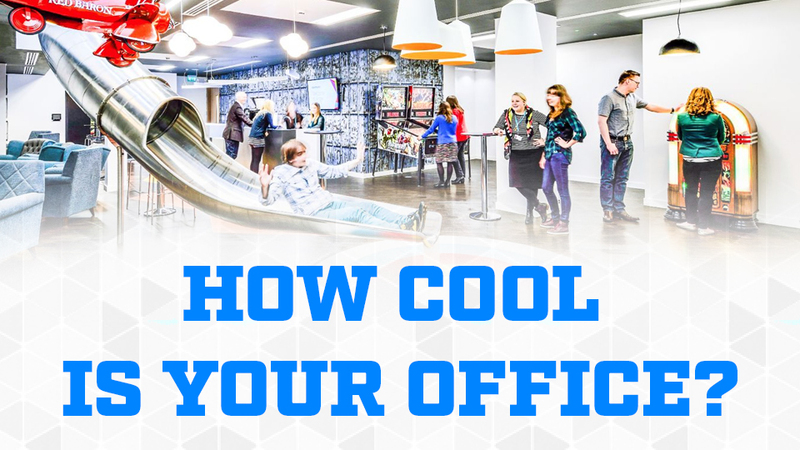 Find out how cool your office really is with our quirky quiz. Your office is the epitome of the daily grind. Dull, quiet, claustrophobic, endlessly monotonous and strict. There’s no room for fun, creativity or even your own personality. You are working for the man! Get out while you still can. The Office that’s Trying to be Cool. Open plan, a computer on every desk, art on the walls and branded mugs. It’s a little bit more inspiring than your average corporate office, but there’s still a strict structure and the only creativity they really like is when it comes from their own heads. You can’t truly be yourself there and in time, it’s likely to crush your soul. Not Too Crazy. Not Quite Cool. Your office ain’t too shabby! It’s a cool space but the work and the rules still out-way the fun aspect. Your creativity often gets caught up in red tape, so while the sentiment is there, the structure and set up of the workplace means that a lot of ideas never come to fruition. You are soooo close! Colourless, lifeless, soulless, cubicled hellholes DO NOT live here! Free spirits unite! Energy and creativity are encouraged and celebrated. Fun is expected and passion rewarded. Your commitment is measured by the quality of the work you produce, not by the number of hours you sit at your desk. Congrats! You, my friend, are in a cool as cucumber office! The walls inside your office are…. When you wake up on a weekday you…..
<p><a href=”https://www.euroffice.co.uk/blog/cool-office-quiz-2/”>How Cool is Your Office Quiz</a> by <a href=”http://www.euroffice.co.uk”>Euroffice</a>.